I had been anticipating this one for a long time. Seeing lovely Leo on the big screen never gets old, even though he certainly looks weathered in this film. There's a lot of hype surrounding this movie - how did the cast and crew survive those gnarly filming conditions? Will Leo finally win his Oscar? While it was a little long and strangely lacked a lot of dialogue, for the most part, this film delivers. It's very much in the style of Director Alejandro Iñárritu, who found fame with films like "21 Grams" (one of my all-time faves) and "Birdman" (one of my not so faves). Calling "The Revenant" a tour de force by Leo is an understatement. For those of you who aren't familiar with the term "revenant," I looked it up for us. It means "a person who has returned, supposedly from the dead." This film tells the story of one man's quest for revenge, and he truly goes through hell and back, escaping death multiple times to do so. 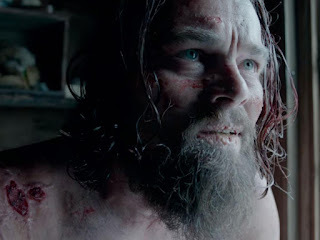 Leo plays Hugh Glass, a fur trapper exploring uncharted territory in the early 1800s. After a vicious bear attack leaves him immobile, a few men (including Glass' son) linger back to see that he has a proper burial after his inevitable death. One of the men, Fitzgerald (Tom Hardy at perhaps his best), decides they would all be better off if Glass were to just die already. Right in front of him, Fitzgerald offs Glass' son and leaves Glass to die. Throughout the movie, Glass keeps reciting a mantra he told his son a long time ago, along the lines of: "If you can still catch a breath, try to keep living." This mantra keeps him going through more than one person should in a lifetime. His will to live is relentless. This was such a physical role for Leo. His physicality is unlike anything I've ever seen him do. Several visuals will stay with me: Leo eating (and almost puking up) real raw bison liver; the warm horse carcass that becomes his shelter during a storm - and I can't imagine the cold, wet clothes they had to wear the whole time! Leo is as much the star of the film as is the cinematographer and the landscape. You'll want to make sure you have a jacket on when you watch it. Seeing these men try to survive (barely) in the grueling exterior is truly remarkable. I would be remiss not to dwell a bit on Tom Hardy's performance. His character is so distusting and loathesome. The evil in his eyes is as evident as Leo's despair. He isn't getting the attention he deserves from this role. It's also worth noting that there's very little dialogue in this film. Leo had about 15 lines during the whole thing. The soaring score only graces our presence thrice during the movie - we hear the brush of the wind and the running of the water more than anything else. This movie is a lot to take in. You'll be thankful of your warm coat, cooked food and roof over your head. More than anything, I will be thankful when Leo gets onstage to accept his Academy Award. If this role doesn't prove that he is the greatest out there today, I don't know what possibly can.